Sometimes people wonder what these odd four-string instruments are. These days, we’re so used to the 5-string banjo and the 6-string guitar that other forms are unfamiliar. In the early part of the 1900s, the four-string banjo started to appear, with the first commercially produced model built by Vega around 1908. This instrument was based on some principles of other mandolin, mandola type instruments – particularly being tuned in fifths to CGDA and played with a pick. This provided a large pool of players who already knew all the chords and scales. The real factor driving the development of the Tenor banjo, though, was cultural. Social conventions were becoming considerably less restrictive at the end of the Victorian era. With this, the possibility of dancing was becoming extremely popular, especially to the new Ragtime and Dixieland Jazz music forms. These featured brass and other wind instruments and pianos. This rise in popularity of the tenor banjo meant that dance halls sprouted up in many locations, and dance halls need dance bands. In a sizeable hall with a large audience and a band that involves horns… you need a loud instrument to be heard. The Banjo design, particularly with resonator, was perfect. It’s percussive, loud, and as it does not have a lot of sustain it supports the rhythm without competing with the melody. The large number of mandolin family players could pick it up with very little re-training. 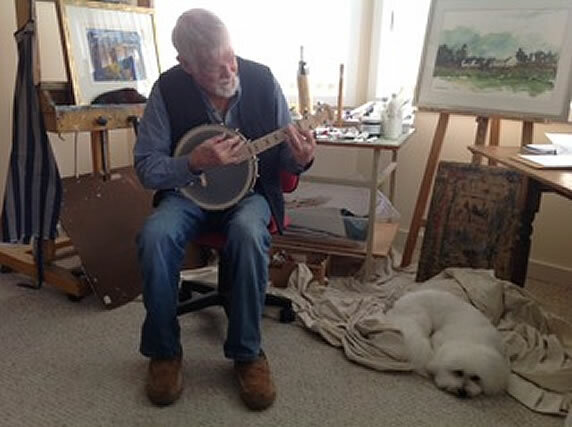 Though the banjo was originally a fingerstyle melody instrument, by 1914 or so it was being played with a plectrum or pick, and firmly footing the rhythm section. Banjo and mandolin makers also worked together with music publishers to standardize the way music was presented. As ‘Tenor’ instruments, their music should ‘properly’ be written in the Alto clef, but as that’s not extremely common, they agreed to use the Treble clef for mandolas and banjos, and this increased the accessibility of the instrument. The main characteristics of the tenor banjo are the short, four string neck, steel strings, and a large diameter rim with resonator. The steel strings and large diameter rim have one purpose, and that’s to increase volume. These are built to be loud and percussive to support rhythm. For a time around 1915, the name ‘Tango Banjo’ was used to describe these instruments, as the Tango craze swept the USA. Since the 1960’s, the Tenor Banjo has been most often heard playing Irish music, tuned an octave below the fiddle and as GDAE. In North America, it has been mostly displaced by the 5-string banjo in country and bluegrass styles. The Tenor Guitar is closely related to the Tenor Banjo. This is not the first banjo influence on the guitar. In the 1930’s as the banjo waned in popularity, banjo players wanted an easier migration to guitar and prevailed on guitar makers to make more frets available. This is why nearly all acoustic guitars now have 14 frets clear of the body instead of 12. Tenor guitars are often used as melody instruments in Irish music, but as you can see from Richard Durrant’s excellent work, it has a place in other styles, too. Solid body electric Tenor models also make an appearance from time to time, used in pop and blues styles.